In less than one week I'll be set-up for Art Festival Wolfville. I only do a few select show/sales during the year, so it's a lot of pressure. But then again, setting up a booth and moving a ton of pottery is a lot of work too and it takes a younger body and soul to do it on a weekly basis. So... For the first and only time this summer you'll find me set up at Luckett Vineyards on Saturday, July 27th. The view is stunning. SERIOUSLY STUNNING! There will be music and food and lots of art. Bring some money. Support the artists. Take home some unique pieces made by people in your community. I hope you're able to make it out to the event. 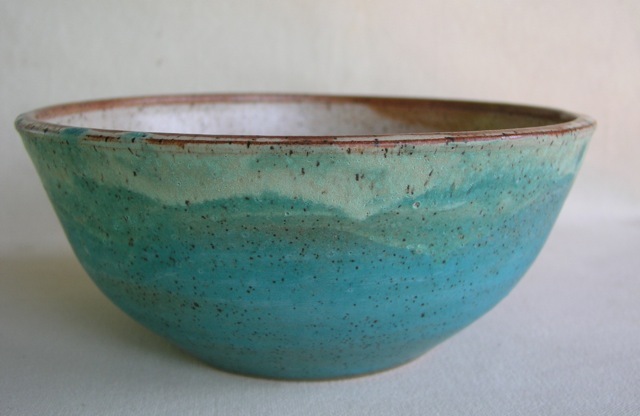 Large bowl in the new turquoise and cream glaze combination.